An aching neck or lower back can force even the most dedicated cyclists off their bikes. 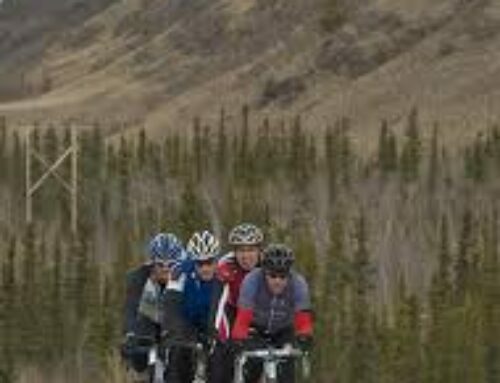 Cycling is a terrific form of exercise, but its bent over pedaling position tends to shorten the muscles in the neck and spine, which can lead to tightness and pain in the lower back, neck, hips, sacrum and hamstrings. Here are a few yoga poses to add to your routine. Perform them daily or after you ride to help stay loose. Why it works: The series of forward and back bends lengthen the spine, reducing tension and lower back pain. Try it: Start on all fours, arms and legs directly below your shoulders and hips and with a neutral spine. Inhale, tipping the pelvis and head up, allowing your stomach to sink. As you exhale, tuck your chin into your chest, rounding the back. Why it works: The pose mirrors the proper body alignment for cycling and opens up the chest, shoulders and hamstrings. Try it: Begin on all fours, but place your hands slightly in front of your shoulders. Exhale and tuck your toes under as you press your tailbone toward the sky. Press your heels toward the ground and have a slight bend in your knees to start. Press down onto your forearms, keeping your elbows directly under your shoulders and relaxing the shoulder blades as you create space. Take deep breaths and hold the pose for a minute or longer. Why it works: Bridge counteracts the bent over position cyclists hold. This pose lengthens the spine and helps loosen up the back. Try it: Lie on your back with bent knees. Keep the feet straight and under the knees and walk them a few inches in toward the hips. As you inhale, push up through your feet until your pelvis is a comfortable distance from the floor. Clasp your hands underneath your back and slide your shoulders forward. Hold this position for at least 30 seconds. Why it works: Cycling creates tight IT bands and hamstrings. This pose releases them. Try it: Start in a standing position. Step your right foot back a few feet, angling it out slightly. With square hips, reach the hands behind your back and clasp your elbows. As you inhale, look forward. As you exhale, fold forward from the hips as you fold over your left leg. Keep your spine long and bend the left leg if the stretch is uncomfortable. Hold the pose for at lest 30 seconds and then repeat on the other leg. 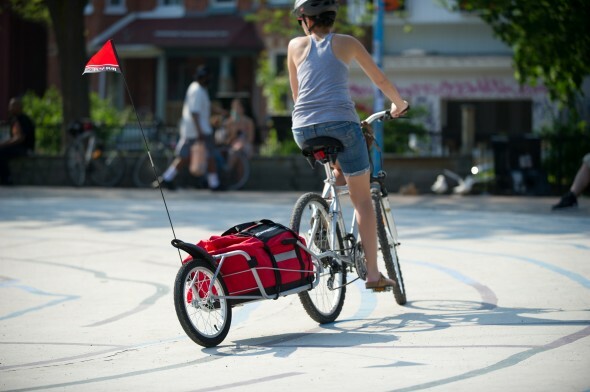 Take the load off your back and let Maya Cycle bicycle trailers carry the weight of your day! Yoga has many benefits and those benefits apply to those living with intellectual and physical disabilities as well as the general population. 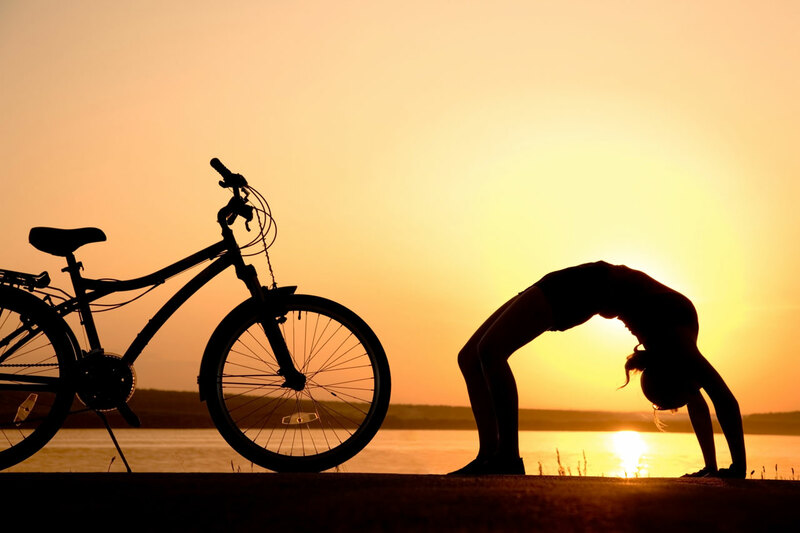 A yoga practice focused on flexibility, core strength and balance can be a perfect cross-training workout for the avid cyclist. The beauty of yoga is that modifications are limitless. A wonderful Tibetan energy yoga with Lama Surya Das on the Great Luminous Perfection teachings of Dzogchen.